Pepitas or nut of choice, granulated and brown sugar, corn syrup, baking soda, cayenne pepper, butter, water, salt and vegetable oil. Start by toasting the pepitas and oiling a spatula. I found the wooden one worked best. It's firmer and spread the hot mixture the best before it got too cool to spread. Add the water, granulated and brown sugar, cayenne pepper and the corn syrup into a saucepan over medium-low heat. Yes, I have two candy thermometers in the pot, my new high-tech thermometer's battery died. Thankfully I have a trusty low-tech thermometer that came to the rescue. 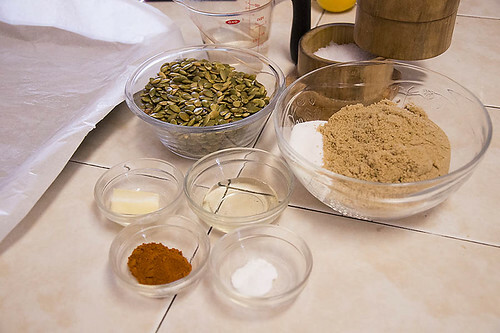 Remove the saucepan from the heat, add the baking soda, butter, and the pumpkin seeds, stirring as fast as you can. Stir well and immediately scrape the mixture onto the buttered baking sheet, it hardens incredibly fast. Spread evenly with the greased spatula to about 1/4" thickness. Here's where the wooden spatula works so much better than the rubber one. I packaged them into cute little Christmas bags, 5oz per bag and sold them at the church Christmas bake sale. Heat a medium skillet over medium-low heat. Add the pumpkin seeds and let them toast, slightly, until they start making popping sounds and have begun to darken, 3 to 4 minutes. Scrape onto a bowl and let cool. Use 1/2 tablespoon of the butter to grease a 6” x 10” nonstick rimmed baking sheet. In a medium saucepan set over medium-low heat, combine the water, brown sugar, granulated sugar, piloncillo and corn syrup. Stir with a wooden spoon or spatula until the sugars dissolve. After 15 minutes or so, the mixture will have achieved a very thick syrup consistency and will be actively bubbling. Check with a candy thermometer to make sure it reaches 290 degrees Fahrenheit (but no more than 300 degrees), or the sugar is at “punto de bola” or “hard crack” stage, then, turn off the heat. Now you have to move fast: Grease a spatula with vegetable oil. Remove the saucepan from the heat, add the baking soda, the remaining butter, and the pumpkin seeds, and quickly stir as fast as you can. The mixture will be bubbling for a few seconds. Stir well and immediately scrape the mixture onto the buttered baking sheet, as it hardens incredibly fast. Spread evenly with the greased spatula to about 1/4" thickness. Sprinkle salt on top if desired. Let cool for 20 to 25 minutes and break into pieces. 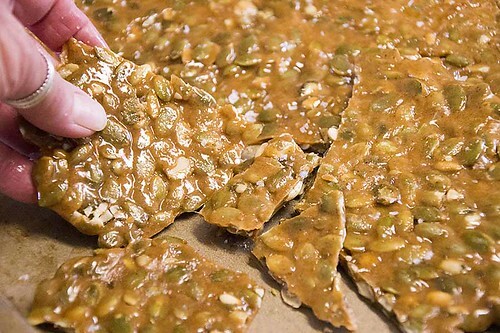 If you want to cut the brittle in even square or rectangle shapes, use a moist knife to do so a few minutes after you poured, before it really hardens. Leave it to further cool, dry and harden. 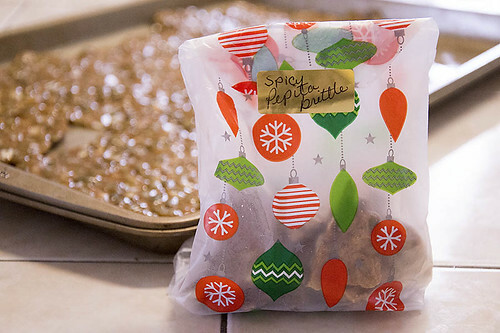 The brittle will keep for a month in an air-tight container.